For made-to-last workwear in any industry, you’ll find the biggest and best range of workwear in South Africa at Workhorse Clothing in Bloemfontein, Klerksdorp or Strand. Workhorse Clothing is your biggest supplier for reliable workwear for any industry in a number of trusted brands. 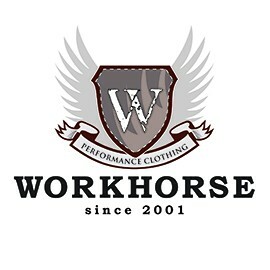 From corporate, construction and medical to casual and promotional clothing and even outfits for the security industry, you’ll find it at www.workhorse.co.za. Franschise options available countrywide. Workhorse – the right fit for the right job. Workhorse Clothing depot service all sectors of the industry and offer quality garments at competitive prices. Our Workhorse branded workwear is proudly manufactured in South Africa and both durable, comfortable yet affordable. We offer a huge range consisting of corporate wear, medical, promotional, service uniform, security, haccp garments, flame retardant, acid resistant, combat, freezer, sport, school, safety shoes ,Hi visibility, chef wear, khaki also brands like Wrangler, Lee, Sterling, and Cat to name but a few. All our Workhorse garments are triple stitched and have YKK zips. We also do embroidery, screen-printing, sublimation and manufacture to customer specification.